Or, get it for 52400 Kobo Super Points! Musculoskeletal ultrasound has greatly changed the way healthcare providers in diverse fields diagnose and treat patients. Advances in technology have made machines cheaper and easier to use while producing high quality real-time images at the bedside, prompting some to call it the "twenty-first century stethoscope." Many healthcare providers (including physicians, physical therapists, PAs and NPs, athletic trainers, emergency medical technicians and nurses) at different levels of training (practicing clinicians, teachers, students, residents and fellows) are seeking training and certification in this field. 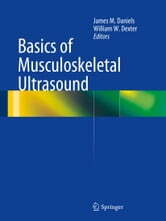 Basics of Musculoskeletal Ultrasound combines practical clinical aspects, from selecting the proper ultrasound machine to "knobology" and tissue scanning, to specific information organized by anatomical structure. By following this very easy step-by-step guide, the clinician can easily reference the patient's position, transducer position and the structure to be scanned, and all instructions correspond with recently published ultrasound guidelines.